NORTH PARK MIX--The buzz at Bar Park last night was focused on the opening of Wang’s, a new Asian restaurant in what originally was the J.C. Penney department store (built 1942). Bar Pink, a good neighbor was hosting a fundraiser for the North Park Toyland Parade. Soon after, Todd Gloria facebooked that he had been on-site at Wang’s earlier. He, like so many North Parkers, praised the heavens--and Wang’s GM/partner Tom Eads--for taking the leap of faith in opening a restaurant in such a huge (40,000 sf) space. Can’t miss the big red signage at 3029 University Ave at Ray Street, 619-291-7500. 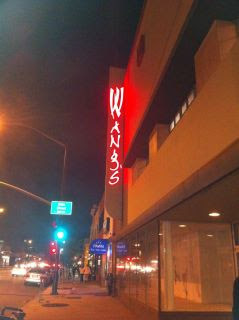 Wang’s has a sibling restaurant in Palm Springs. If you beat me there let me know your favorite dish. Photo credit: District 3 Councilmember Todd Gloria.